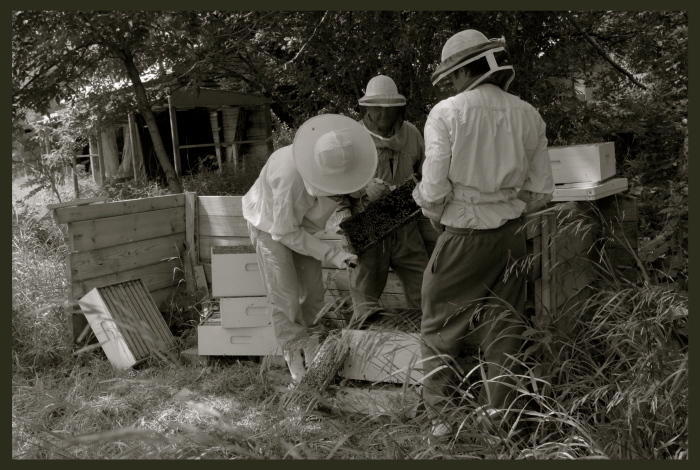 tagged along last weekend with camera and questions as my brother Joe and his assistants (Grandpa and brother in law to be Dan) checked on his hives at the farm. Thought you might enjoy some pictures of the wonders of beekeeping. First they suited up (check out Joes’ wacky looking new bee suit) and loaded the smoker -> with smoldering dry grass clippings. A bees’ instinct in the presence of smoke is gorge on honey in preparation for having to move the hive in a forest fire, making them lethargic and more docile. First they pulled apart the boxes or supers with a small pry bar, as seen below. The supers are just set one on top of another but the bees can stick them together a bit with propolis. Supers are just set aside near by. Next frames are removed from supers with a tong-like frame handle and inspected for mites, queen cells, honey production, hive health. Mites prey on bee colonies and can infect a hive. 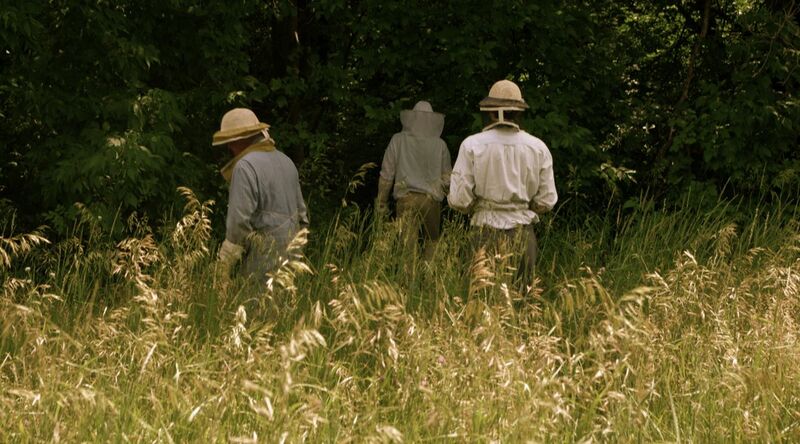 A beekeeper keeps an eye out for queen-cells because a hive’s nature is to always be expanding. If the hive feels like it is running out of space, it will attempt to swarm and split itself in two by raising a new queen. When a new queen is hatched, a good portion of the hive takes off with the old queen and a bunch of the honey. 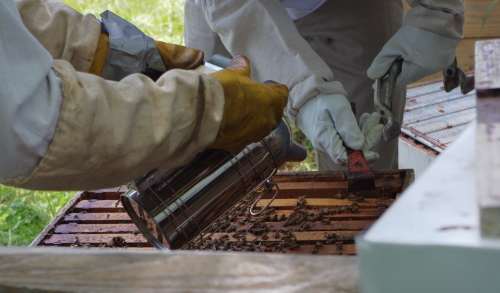 Beekeepers add supers as needed to give the hive more room so they don’t feel the need to swarm and look for special queen cells for queen eggs. 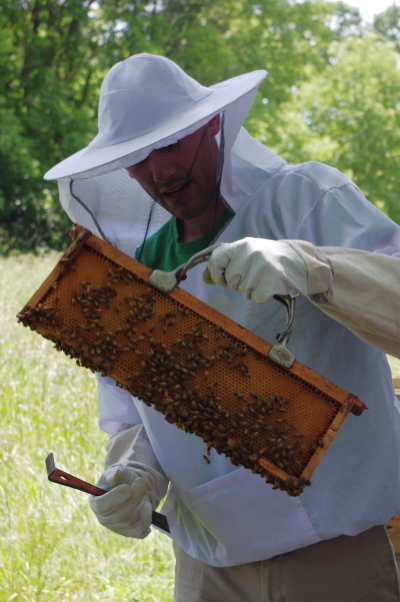 <-Joe inspects one frame of honey-comb. The frames are situated one bee width apart within the super to allow movement between. If there is more space than that, the bees will attempt to fill it with propolis, glueing it shut. It may be hard to see in the picture at right, but when a frame is removed, the bees will make a bridge to span the gap by holding hands making a little U shape of bees strung together allowing other bees to traverse the space by climbing over top of them. Crazy huh? 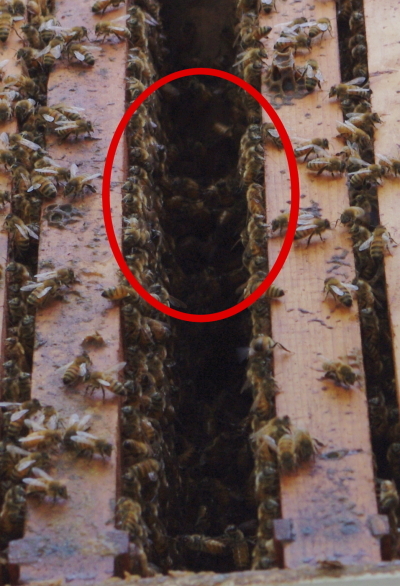 Further down the hive, they encounter Joe’s <-queen excluder which is simply a metal grate that allows the smaller worker bees to pass through it from the lower hive to the upper hive, but contains the larger queen bee in the lower hive, so that she doesn’t lay eggs in the supers above filled with honey. 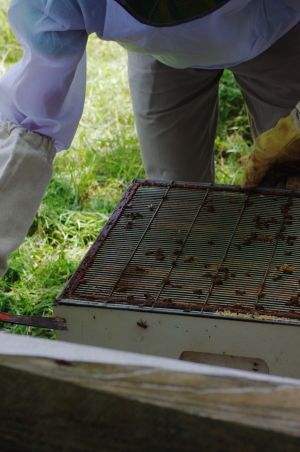 On the top of the hive is a <-telescoping lid which allows for ventilation while keeping the weather and elements out of the hive. 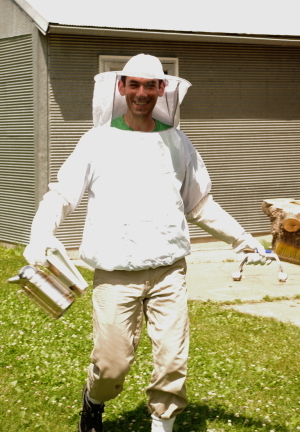 The hive in the pictures seems to be doing well this summer and Joe is hopeful he will harvest a bit of honey off of it later. The other hive on the farm is not doing as well. 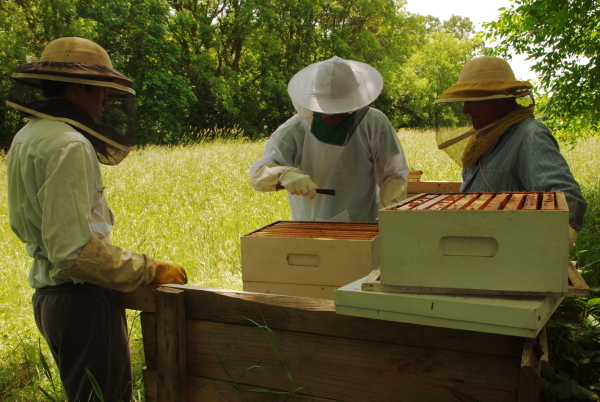 I will leave you with one more picture of these three amigos wandering off to check the other hive. This entry was posted in Beekeeping, DIY!. Bookmark the permalink.